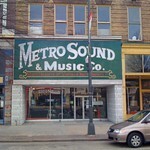 Voted "Richmond's Best Music Store", this shop has been specializing in buying and selling vintage instruments since 1991. Also provides free music lessons for the community. Store Hours are from Tuesday to Saturday, 11:00 am to 6:00 pm.